by Ken KremerA brief note from the pre-launch press conference Tuesday, September 25: A report will follow soon. The important news is that the launch remains on schedule for Thursday, September 27 with a 40% chance of a weather violation. Clouds are rolling in here at the Cape on Tuesday afternoon and the concern is for rain showers on the morning of launch. A final weather call can be made as late as 3 seconds before the launch. 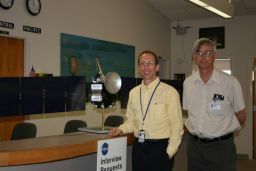 Monday, September 24 I had the fortunate opportunity to have a lengthy conversation with Marc Rayman, who I met at the Kennedy Space Center (KSC), in his few moments of down time prior to launch and the formal pre-launch press conference. We discussed the launch vehicle, spacecraft, flight trajectories, and science goals of what is really a three-body mission: a flyby of Mars followed by orbital science at Vesta and Ceres in that order. First on the launch status, Marc told me that "All second stage fuel had been loaded by early afternoon (Monday) and no issues are being worked at his time." He added that there are no obstacles to starting the final countdown at this point. Liquid oxygen loading begins just after T-80 minutes during the terminal countdown on launch day. Weather is beautiful at the Cape today. The Mission Dress Rehearsal this past Saturday went perfectly. Some final pad work on the spacecraft remains to be completed, however. For example, Marc said that dust covers on two of the three ion thrusters still have to be removed. Readers may have seen these white covers on many pre-launch images, including the one visible in the image from my first report. Technicians at the pad have to retract these dust covers through 46-centimeter (18-inch) portholes in the payload fairing. Marc told me that dust covers for both star trackers and one VIR spectrometer cover are still to be removed as well. Workers at the pad must also reach in to arm the battery that will power the giant solar arrays. The hyrdazine fuel valves have to be properly configured manually by a human hand protected by a SCAPE (Self Contained Atmospheric Protected Ensemble) suit. Round-the-clock operations start at the Jet Propulsion Laboratory in Pasadena, California at T-16 hours and will continue for up to a week after launch, depending on how the systems check out. According to Marc, All files are loaded onto Dawn and verified before the cryogenics are loaded. The team waits until this time to ensure that any last-minute patches to the software are included in the final package and are not mixed up with earlier versions. The first 80 days following launch is the initial checkout period, during which all spacecraft systems are tested, verified, and configured. The ion engines need to be ready for interplanetary thrusting at this point. nd many updated flight geometries are calculated and uploaded during this period. Marc mentioned that numerous fault protection modes are available to automatically correct for any anomalies detected. For example, if the spacecraft attitude is incorrect and a temperature-sensitive spectrometer or other instrument is incorrectly pointed to the sun and being excessively heated, fault protection will adjust Dawn to correct the situation and prevent damage. An engineering model of one of Dawn's three ion thrusters, which use electrical power to ionize xenon gas and accelerate it to a speed 10 times that of chemical engines. Each thruster is 30 centimeters (12 inches) in diameter and is steerable in two axes. 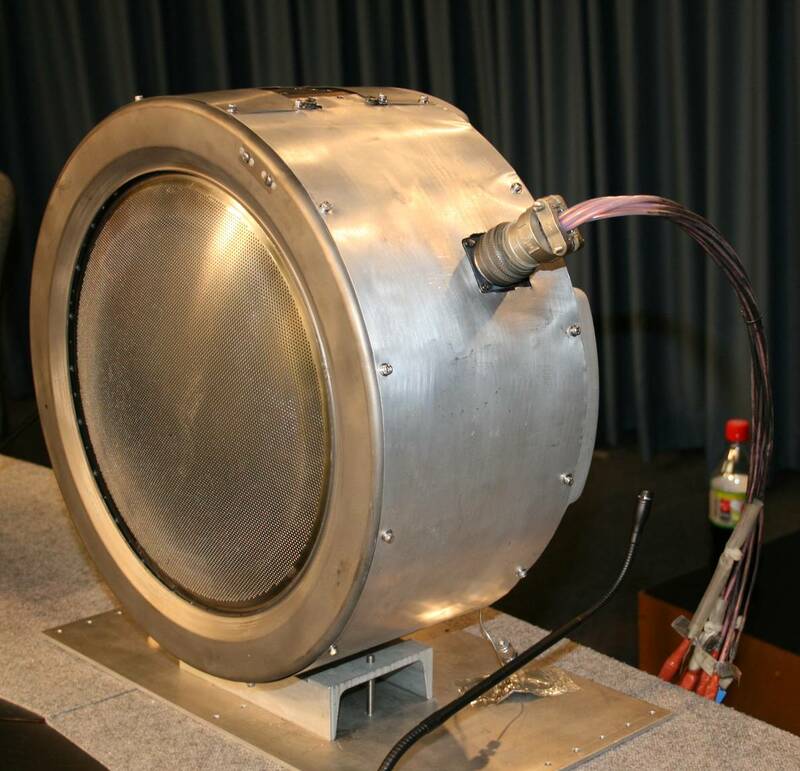 During the initial checkout period, there will be five tests of the ion thrusters. Marc said that these tests are to check out the operation of all three engines and will gradually ramp up in both complexity and tasks. The first test firing of the ion engines occurs one week after launch, right after the reaction wheels do an attitude adjustment and rotate Dawn by 180 degrees. 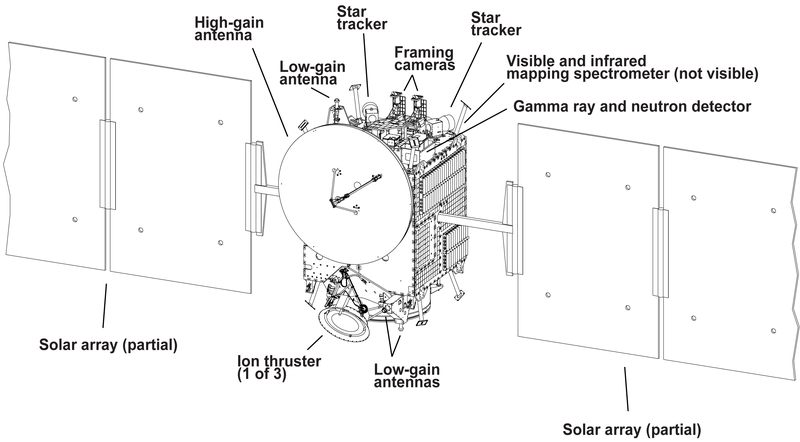 The ion engines are fired so that they are thrusting Dawn directly toward Earth. Controllers on the ground can check the performance of the ion engines through Doppler tracking of Dawn while it is thrusting. ighty days after launch, continuous ion thrusting begins for the long journey to Mars. Under nominal conditions, the engines will fire for approximately a week, stop for about six hours to transmit telemetry via the high-gain antenna to the Deep Space Network, and then resume for another week. Marc explained that this pattern will continue until about two to three months prior to the Mars approach and flyby in February 2009. The Mars gravity assist flyby at an altitude of about 500 kilometers (300 miles) will target Dawn for the proper trajectory on its science mission to explore the largest worlds in the asteroid belt. Finally, we discussed the science goals of Dawn, which is why NASA approved this mission in the first place. Marc told me that some science operations will be conducted during the Mars encounter period by the three onboard science instruments . But these observations will be limited during the approach phase since Mars will be located only about 20 degrees from the sun. He said that both the Framing Camera (FC) and the Visible and Infrared Mapping Spectrometer (VIR) would run too hot to be operated safely. 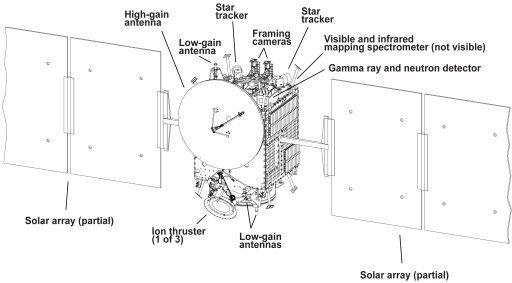 However, the Gamma Ray and Neutron Detector (GRaND) can and will collect approach data. All three science instruments will collect data on the outbound leg. Many dozens of images will be taken during the intense encounter period, which will last several days. Only part of the solar arrays is shown. Each of the two solar arrays actually consists of five square panels. There is significant international participation on the Dawn mission. The Framing Cameras (FC) were built by the Max Planck Institute for Solar System Studies and the German Aerospace Center (DLR) and funded by Germany. The VIR spectrometer was funded by Italy and provided by the Italian Space Agency and the National Institute for Astrophysics (ASI INAF). GRaND was designed and built at Los Alamos National Laboratory. The Dawn spacecraft was designed and fabricated by Orbital Sciences Corporation. Another very important aspect of the Mars encounter will be to test the optical navigation system. According to Marc, the Framing Camera is required for navigation since there is some uncertainty in the orbits of both Vesta and Ceres. The Mars flyby offers the best opportunity to test optical navigation prior to orbital insertion at Vesta. Dawn is actually equipped with two Framing Cameras, but only one is planned to be operated throughout the mission. He stated that the second camera is a backup and will be powered off unless its required because the first one fails. 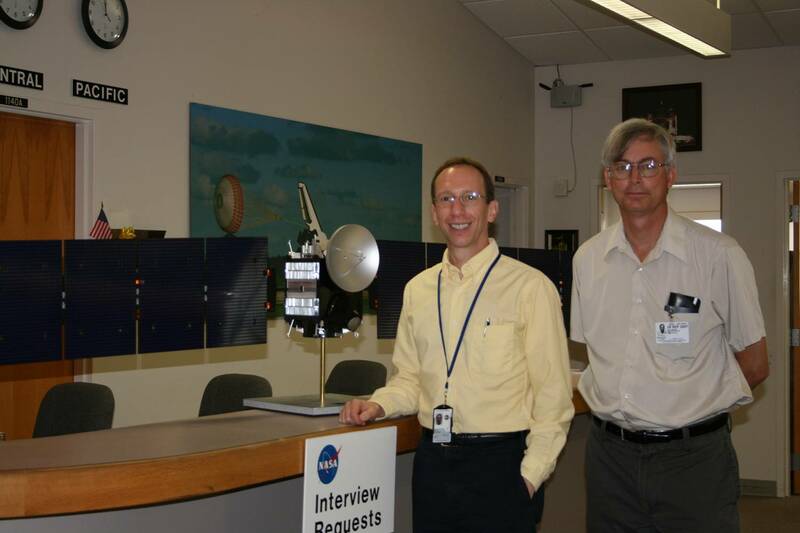 This is standard JPL practice and indeed some Voyager instruments have never been turned on. I asked Marc about the possibilities to approach other asteroids during the long traverse through the asteroid belt. He explained that such considerations will have to wait until after launch due to the many uncertainties in trajectory. There are no predictions at this time. 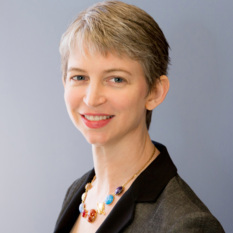 But the team will determine within the eighty-day initial checkout period if a flyby is possible and worthwhile. It depends on the size and also the physical and chemical characteristics of the object and it would have to be miles across. They are not going to expend valuable xenon propellant on a tiny rock and all this has to be balanced with the ability to conduct enhanced science operations at Vesta and Ceres. At Vesta and Ceres, Marc told me that Dawn will attain orbit by gravitational capture purely through the action of the ion thrusters, gradually spiraling in to an initial science orbit over a period of about three weeks at Vesta and more than a month at Ceres. All three science instruments will swing into action for intense data gathering operations to provide global maps and measure the elemental and mineralogical compositions of the surface and near surface. By measuring the gravity fields, scientists will be able to make some determinations of their interior structure as well. Via the ion thruster, the orbit will then be lowered two more times at Vesta to a final altitude of about 200 kilometers, significantly increasing the resolution obtained with the cameras and spectrometers. Likewise at Ceres, Marc indicated that the initial orbit will be lowered over several months to 700 kilometers. Marc said that the ability to achieve these goals of lowering the orbit and increasing resolution is directly dependent on the amount of residual xenon propellant available. Ceres is known to possess vast quantities of water ice. Achieving a lower orbit will significantly enhance the science team's ability to answer fundamental questions such as whether this water exists as a liquid ocean. The answer to that question has tremendous implications in the search for life beyond Earth and whether a world such as Ceres possesses a habitable zone to support the evolution of life on another world. And that is why the science team must carefully balance the trade-offs on how best to utilize the finite quantity of xenon propellant available. Marc explained that at the end of the mission, the rules of planetary protection dictate that there must be a sufficient quantity of xenon available to prevent the spacecraft from crashing into Ceres and potentially contacting and possibly harming alien life forms. Finally, waxing philosophical, Marc said that "the work on this mission is difficult. There are no guarantees in the space business. We are traveling to unfamiliar worlds, which are poorly understood and with unknown gravity fields. So the science payoff is BIG ! Great rewards can only be attained with great challenges."